Clean prawns and remove the heads and shells leaving the tail. Keep the prawn heads for other uses, like to make a prawn stock. Devein and butterfly prawns, then make a small slit under the prawns. Insert the tail end through the hole and pull it half-way through to get a pretty pattern. Marinate prawns with egg-white, salt, ginger, wine and cornstarch for about 15 minutes. Brew a small pot of Long Jing Tea for about 5 minutes. Heat oil and sauteed prawns till half cooked. Add about 4-5 tbsp tea with leaves, mix well and transfer to plate when prawns turned pink. 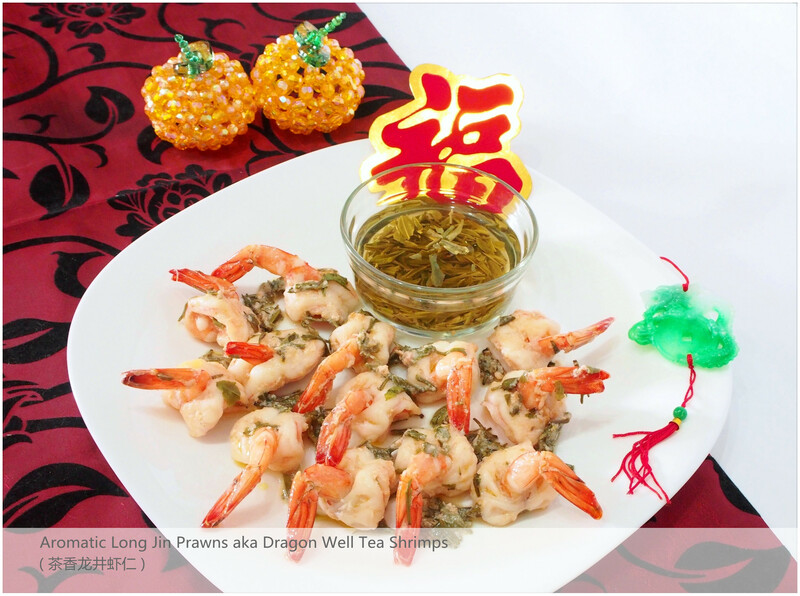 Enjoy the delicate fragrance of this Aromatic Long Jin Prawns ( 茶香龙井虾仁 )! A specialty of Hangzhou City produced by using live river shrimps coated with egg white and moistened starch, the shellfish is infused in the aromatic Long Jin Tea which is rich in antioxidants.